The United States has expressed concern at the trials of anti-corruption activists in China and called for political prisoners to be freed. The US ambassador in Beijing, Gary Locke, said the cases were "retribution for their campaigns to expose official corruption". His statement came as two more activists appeared in court. Zhao Changquing and Hou Xin are members of a group which wants Chinese leaders to declare their assets. Mr Zhao, a veteran dissident who has served time in jail, is charged with disturbing public order and faces a possible five-year sentence. A member of the New Citizens Movement, his case was adjourned after he dismissed his legal team in a move to delay the case, one of his lawyers, Zhang Xuezhong said. Mr Zhao pleaded not guilty and told the court "all his actions, including promoting the asset disclosure of officials" were "legitimate and legal", according to Mr Zhang. Hou Xin, on bail for health reasons, also pleaded not guilty, her lawyer said. The founder of the New Citizens Movement, Xu Zhiyong, appeared in court on Wednesday. A known legal scholar, Mr Xu also campaigned on behalf of inmates on death row and families affected by tainted baby milk formula in 2009. At his trial, he initially refused to speak in court because he viewed the proceedings as illegal, his lawyer said. However, he later spoke for about 10 minutes before he was interrupted by the judge, reports said. An account of Mr Xu's closing statement was posted online by an activist website. Mr Locke also criticised "the mistreatment" of foreign journalists trying to cover the Xu trial. Members of the New Citizens Movement, a lose network which organises dinners to discuss reform and stages small demonstrations, maintain that they are supporting President Xi Jinping's high-profile campaign against corruption, the BBC's Martin Patience in Beijing reports. But with the activists now on trial, the ruling Communist Party is clearly showing that it will not tolerate any challenge to its authority, our correspondent adds. Western criticism of the legal proceedings has been dismissed by Chinese officials as interference in China's internal affairs. 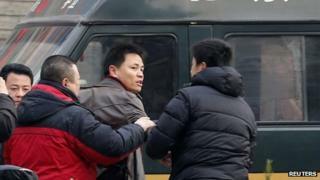 Rights groups have described the crackdown on activists as hypocritical. Brad Adams, Asia director at Human Rights Watch, said on Tuesday: "While Xi Jinping has spoken a lot about tackling corruption and there have been some high-profile arrests, the government has harshly retaliated against those who exposed high-level corruption in the government and party." Meanwhile, Wang Gongquan, a wealthy businessman considered a key supporter of the movement, was released on bail on Wednesday after confessing to "inciting the criminal activity of assembling a crowd to disrupt public order with Xu Zhiyong", a Beijing court said on its verified microblog. Mr Xu's lawyer, Zhang Qingfang, described the court's posting as a "complete distortion of facts". How real is anti-corruption campaign?